The Truro office of the Top 30 accountancy firm will raise money for the New Heli Appeal as part of its centenary celebrations and will become an official gold partner of the appeal, which aims to bring a new air ambulance helicopter to Cornwall by April 2020. In 2018, the Charity of the Year partnership saw the company raise £6,761 for the appeal by taking part in a range of activities from quiz nights and sponsorship, to staff members taking on challenge events such as the Three Peaks. 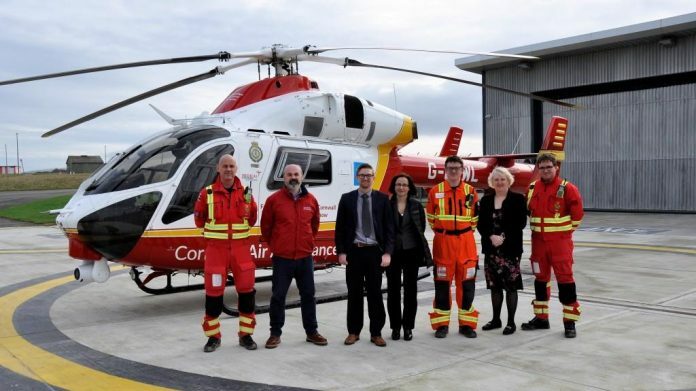 Alison Oliver, partner at Bishop Fleming, said: “We are extremely delighted to announce Cornwall Air Ambulance as our Charity of the Year for 2019 – a second year by overwhelming choice of our team.